Intent on avenging his father's death, General Yamanouchi Kagetora leads an army of men into battle. Alone he has no chance of victory, but he is armed with two weapons: the Ninten Bell and the all-destroying Odama. A combination of pinball game and real-time strategy. 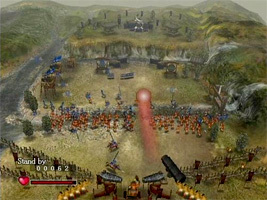 Command your armies with the microphone as they carry the Ninten Bell across the map and through the enemy gates. Meanwhile, use the flippers to send the Odama ball to destroy enemy positions and structures. When the Odama turns into the green Heavenly Odama, you can recruit enemy forces to your own side and will not hurt your own men. There are a lot of references to Nintendo in the game. The Ninten Bell is the key to your victories, and your armies subscribe to the rule of Nin-Ten-Do, the first words of an ancient poem. It is also likely that the Yamanouchis, leaders of the Way of Ninten, are a reference to the Yamauchi family who founded Nintendo in 1889. On the Karasuma Keep stage, knock the Odama through the keep gates. 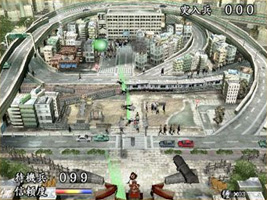 You will be transported to a bonus stage set outside Nintendo's Japanese headquarters in Kyoto. You have to knock the heavenly Odama around to recruit people as Nintendo employees.